Last edited by thebigham on Tue Aug 11, 2009 4:59 pm, edited 1 time in total. BSOR has severe damage from the recent rain storms and flooding. That's all the info I have. Wishing them a speedy recovery of operations. 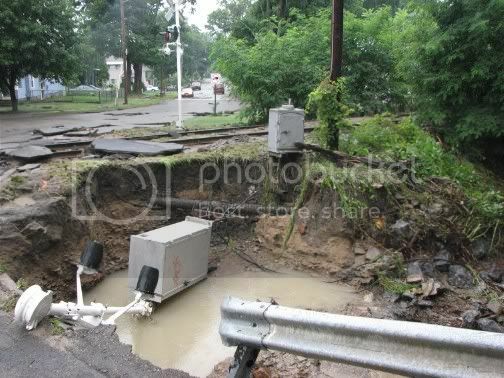 thebigham wrote: BSOR has severe damage from the recent rain storms and flooding. That's all the info I have. Too bad. I'm sure BSOR Patarak can fill us in on the details. I was out watching them them Friday and Saturday as they brought in the Strates Shows train. 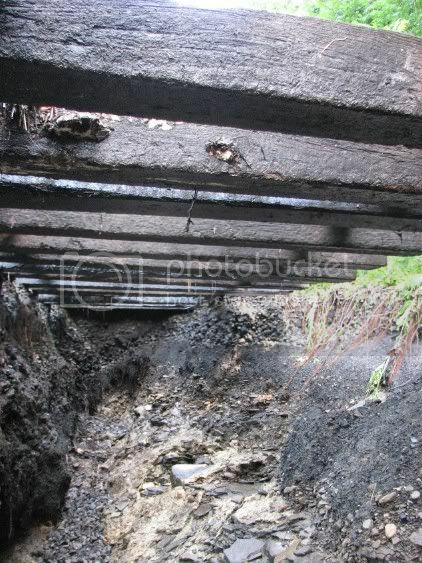 After the severe flooding that hit the region early on the 10th of August, there was serious damage to the tracks of both the BSOR and NYLE. The tracks will be fixed in time, but the devastation to the Gowanda and Silver Creek areas will take much longer. People have lost everything through out the areas. The damage to the track is secondary to what must be fixed in these towns. My heart goes out to those in need now. As for us, the damage and repairs are being surveyed now so that a plan can be put in place to restore rail service to the south. The BSOR can still operate the northern section from North Collins to Buffalo. The Fair Train will go out as scheduled on the 24th. Please do not try to go to Gowanda and see the damage unless you have business there. There is so much mud and debris that extra traffic makes clean up difficult. Donations are being taken through the Red Cross and Salvation Army to help the residents of the two towns. Warm meals are one area that are lacking at this point. I always wondered about this. Do railroads carry some form of insurance on their physical plant? I remember hearing about how Hurricane Agnes helped in the demise of the EL back in the 70's. Is it the repairs, or the lost freight revenue that cause the financial trouble? Good luck with all the repairs, Pat. The EL had to repair their tracks out of their own pocket, using funds that had been set aside to upgrade Marion (OH) yard and wiping out their cash reserves. Railroaded wrote: I always wondered about this. Do railroads carry some form of insurance on their physical plant? I remember hearing about how Hurricane Agnes helped in the demise of the EL back in the 70's. Is it the repairs, or the lost freight revenue that cause the financial trouble? As far as I know, many larger railroads (class ones) are insured through themselves - meaning they are indeed the ones paying for everything (while still technically having insurance), so it's easy to see why the financially-strapped EL was essentially wiped out after Agnes. I know that at least most shortlines are insured through actual insurance companies by contrast. What's the current status of the mill operation in Buffalo? Any switching being done there? Anyone want to help me ut with this one? Lake Ave in Blasdell today, Tuesday, on the BSOR line Alco 1847? was sitting there about 200 feet from the crossong with the old plow that was sitting south of the Erie depot near Laveview Rd. for over a decade. Where's it going? Something I've always wondered: why is this line operated by two railroads instead of one? Interesting question with no easy answer. You have to look back at the beginning of the NYLE and shortline operation of the BSW division. The NYLE originally did operate north to Buffalo. The NYLE wanted to operate both passenger and freight operations. In the early days, Buffalo wasn't the only connection to the outside world. There was Waterboro and Salamanca. The NYLE used Salamanca early on, as it had a Conrail and BP connection. There was also the Salamanca Rail Museum that was a "draw" for passengers and had passenger equipment available too. The two railroads were separated at the county line at Gowanda over the Cattaraugus Creek. As the NYLE had decent connections on the south end of their line, and concentrated on passenger operations, they gave up the north end. The remaining customers on the north end of the BSW formed a shippers coalition to ensure that rail service remained on the line and hence the BSOR was incorporated. At the beginning of the BSOR, the section to Gowanda was not utilized as an interchange for the NYLE. There was a bit of coal traffic left at the Gowanda Psychiatric Center (that later became the prison) so the line was kept open the whole way. Now fast forward to today, the northern connection is the only active one. Both Railroads have been well established in different fields and this is how it remains. (The NYLE has the Titusville operation and past corporate relationships with Canadian Operations, while the BSOR operates it's section as well as contract in plant switching). Can you please comment on how the flood repairs are coming along on the BSOR and the NY&LE? Was I going to guess I'd postulate that each half of the line is owned by the respective counties the track is in, and was originally run by the NY&LE under seperate contracts/operating agreements for each county, which is what allowed them to give up the north end. I am somewhat surprised that there's no interchange on the south end anywhere, but then I seem to remember reading that the leg to Salamanca that was part of the original Erie line to Dunkirk was out of service at some point not that long ago.